On Tuesday evening (January 16th), there will be a public hearing about an ill-advised and controversial bill that would add large Warehouse Distribution Centers to what is allowed in the county’s Mixed Use Development zones, which currenty includes the Urbana Town Center, the Urbana Office Research Center, Westview South and the Jefferson Technology Park (with its hundreds of homes). 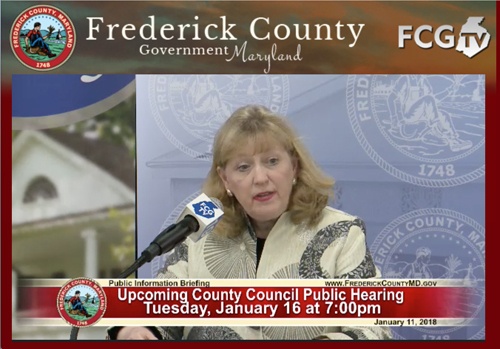 The video linked here is of a public briefing by County Executive Jan Gardner, on Thursday, January 11, 2018. It is entitled “Public Information Briefing – Open and Transparent Government,” and if you have the time, I encourage you to watch all of it. Her very informative comments about Bill 17-21 start seven and a half minutes into the briefing, and last about ten minutes. That bill was introduced by the council President Bud Otis, As noted above, it would add a new permitted or allowed use – warehousing and distribution centers – in areas zoned as MXDs or mixed use developments. Below the image and link, please find a text version (not a verbatim transcript) of the portion of the briefing where County Executive Gardner discusses this particular bill. “Next week, the council will hold a hearing on Tuesday evening the 16th on Bill 17-21, introduced by the council President that would add a new permitted or allowed use – warehousing and distribution centers – in areas zoned as MXDs or mixed use developments. Mixed use developments allow four types of land use: residential, commercial, employment and institutional. When the application for a mixed use development is reviewed and approved, these land uses and the areas where they will be allowed are established. Each land use type has a defined list of permitted uses. Currently, employment uses in a MXD are restricted to those allowed within the office, research, industrial zoning district, which are intended to be are compatible and supportive of the residential and commercial components of the project. For instance, office and research uses bring certain building types and the nature of their operation is usually day time with limited traffic, noise, no outdoor storage, and so forth. A wholesaling and warehouse use, by the nature of the business, is very different. These uses require a different building type, may need outside storage, are often served by significant large truck traffic and in some cases may have 24 hour operations. While these operations may be appropriate in MXDs under certain circumstances, compatibility with surrounding uses including residential uses must be considered. Permitting this use by legislation has the effect of rezoning the property without the public notice and public process that are typically associated with a rezoning. Such as posting the property for 30 days, and notifying adjoining and confronting property owners. The lack of public information about the proposed bill, concerns me. I will always do my best to protect citizens and provide good government. Knowing that no public explanation of the bill had been provided, last Friday staff mailed out more than 600 notifications about the proposed change to people who own land in Mixed Use Developments as well as to adjoining property owners and nearby homeowners associations. These are the people who would most be affected by the proposed change. Imagine how you would feel if you moved into your home, knowing that only certain types of offices and businesses could legally be built in the neighborhood, only to later find out that someone changed the rules to allow tractor-trailers to load up at warehouses around the corner from your home, potentially with a 24/7 operation. While this effort has been made to notify residents by mail, it remains short notice. Also of great concern, this proposal includes language that would allow property owners or developers with an approved Developer Rights and Responsibility Agreements to utilize these new code provisions without amending their DRRA. This raises serious legal questions and concerns. The DRRAs are legally binding contracts. Generally, contracts cannot be revised by legislation but rather by re-negotiation by the parties associated with the contract. All of the DRRAs do have language that allows certain laws to apply if there is a finding that it is essential to public health and welfare. This legal issue is of great concern to me. The parties that entered into these contracts or DRRAs did so with their eyes wide open and with their attorneys. The stated objective was certainty in terms of the laws that applied to the development. It is my job as the County Executive to uphold and enforce the DRRAs and all contracts entered into by the county. And that is what I intend to do. Should this law be passed as drafted with this DRRA language in the transition provisions, I will likely veto it for this reason alone, because of the legal concerns raised. If it passes by a veto proof majority, I will continue to do my job to enforce the DRRAs. Had there been discussion or a workshop on this proposal or interaction with the drafters and county staff, other options to accomplish the objective of this bill could have been discussed and a better process could be utilized. For instance, there is an option already in the county code that provides the council with the authority to reduce or increase the size, type, location and mix of the various land use components within a MXD. Under current law, a developer could ask the council to change some or all of the employment designation to commercial designation which would then permit a wholesale/warehouse use. This would then generate a public hearing process with appropriate notification and opportunity for public comment. The proposed bill requires that the wholesale/warehouse will not be constructed of a majority of metal materials. But it does not address outside storage, appearance and location of buildings, impacts on traffic and already established neighborhoods. I am very concerned that this legislation does not fairly consider impacts to existing residents, and the promise of the development project that they bought into when they purchased their homes. It also doesn’t generate the needed discussion about available land for this use or the changing retail environment. As the retail world changes, and we know it is changing, the county will need to adapt its laws to embrace e-commerce and the reality that many retailers may wish to transition their existing brick and mortar space to distribution centers to provide same day or next day delivery of whatever they sell. Consumers are shopping online and having items delivered to their homes. This expands the need for e-commerce and for warehousing and distribution operations, and will transition some existing retail Into more distribution uses. Thus, it is my intent to establish a workgroup of economic development, planning staff, and other stakeholders to talk about how we adjust to this changing retail market, so we can welcome these jobs. And make sure we keep our promise to existing residents and surrounding communities. The administration will be providing a detailed report and a legal brief to the county council on this bill for their information and consideration. Unfortunately the council has decided, by the council president, to only allow administrative staff three minutes to present this information, making it impossible for us to share this information in a comprehensive fashion with dialogue that could have been accomplished at a workshop. I really encourage the council to workshop bills they introduce. All the bills I have introduced as County Executive have had public workshops and have had other outreach meetings as appropriate. The only two complex bills that have not had council workshops are the two recent bills introduced by the Council President: The FRO “alternate” bill, and this expansion of permitted uses in an MXD. These bills merit workshops, public debate, and a good public process and I urge the council to consider a better process so that the good government we have had in place can continue. Absent that, I will do my best to provide this information to the public, and to provide public notice to impacted residents. The legislative process is designed to be open and transparent for a reason. The public has a right to be heard. Typically, a Council Member will introduce a bill that they drafted, or one that the administration requested. The wording of the bill is posted on the county’s website a week before the bill is discussed at a Council meeting so that the public can read it. If the bill is from the administration, there will also be a report from staff posted that explains the need for the legislation. The staff report includes background information, any fiscal impact of the bill, and other relevant details. Again, this is in the interest of open government. Citizens have a right to know what a bill does, why it is being introduced, and what its impact would be. The decisions that are made in Winchester Hall have a direct impact on the citizens of Frederick County. That is why I want to encourage people to become engaged in the public process. We make better decisions, and better represent the legitimate and sometimes competing needs of the county when people have the opportunity to weigh in. The best ideas often come from the people. The Council will hold a public hearing on allowing wholesaling, warehouse and distribution facilities in Mixed Use areas. 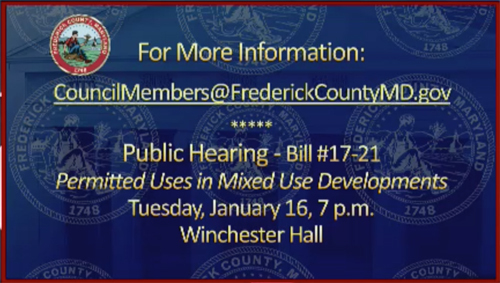 That public hearing is planned for Tuesday, January 16th , at 7:00 p.m. in Winchester Hall. There is also time at the beginning and end of each legislative Council meeting for the public to comment on any issue they want to raise. Let the Council know that government belongs to you the people! Click here to read an informative letter, from the Smarter Growth Alliance of Frederick County, expressing opposition to the proposed MXD legislation.